The Korean Zombie Chan Sung Jung says he could get a title bout if he defeats Frankie Edgar at UFC Fight Night 139. The Korean Zombie Chan Sung Jung will make his long awaited return on Nov. 1o when he faces fellow UFC featherweight legend Frankie Edgar in Denver. Jung hasn’t fought since February 2017 and has been on the sidelines following a knee injury he sustained during his preparations for a fight with Ricardo Lamas last July. With fight night now just a few months away, Jung took part in a media event in Seoul where he spoke with Yonhap news. Suffice to say, Jung feels like he’s back to full fitness and has no anxiety surrounding his lengthy layoff. “Compare to the time of absence that I went through ahead of the Bermudez bout, this 21-month absence isn’t really a big deal,” he continued. The fight with Edgar presents a showdown between two fan favourites fighting at 145-pounds. Both fighters are known for putting on exciting fights and Jung thinks he has a good idea where Edgar will want to try impose his will. “I asked myself, ‘What would Edgar do to defeat me? '” Jung said. “Then I answered that he’ll try to take advantage in wrestling and maybe go for a submission. 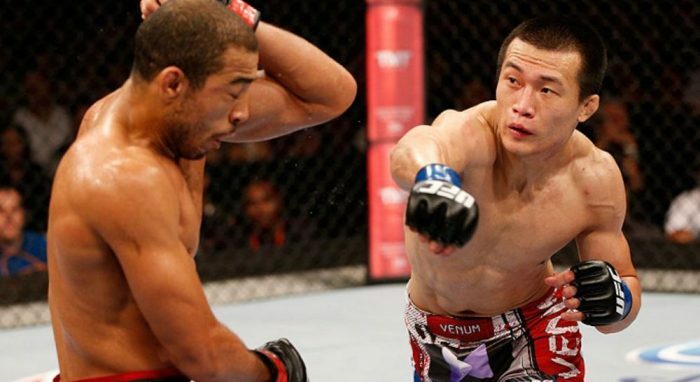 Having tried and failed to secure UFC gold against Jose Aldo back at UFC 163 in Aug 2013, Jung believes that a win over Edgar could put him next in line for a title shot against the winner of champion Max Holloway and Brian Ortega who look set to meet at UFC 231. “I think it’s great to fight against a living legend,” Jung said regarding Edgar.